A lot has changed since Kathy Kramer started the Bringing Back the Natives Garden Tour in 2005. In those days, native plants were much more difficult to find in nurseries, and there wasn’t as much information readily available for people who want to plant them in their gardens. Resources like Calscape didn’t exist to provide people with information about which California native plant species are right for where they live in California, what conditions the plants require, and where to buy them. It was hard to find designers who specialized in creating California native plant gardens. 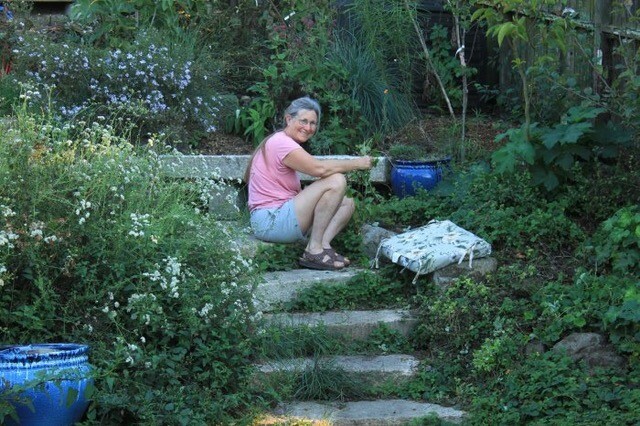 It started when Kathy read Sarah Stein’s Noah’s Garden, and decided she wanted to transform her garden—then a mass of ivy, cotoneaster, and Himalayan blackberry—into an area that would provide food, shelter, and nesting areas for wildlife. On that quest, she went to a California Native Plant Society plant sale, and in the frenzy of the sale she came home with a Ceanothus hearstiorum. The common name of this plant is Hearst’s Ceanothus, and its native range is the hilly coastline of San Luis Obispo County. Not knowing that it was a coastal plant requiring shade and some summer water inland, it died in her East Bay garden, where she had planted it in full sun. Some people would have been discouraged by this, but it only made Kathy want to learn more about native plants. When Kathy visited the natives sections of East Bay botanic gardens, she found it difficult to translate the vastness of those settings to her small lot. While hiking, one can see how beautiful California natives look in the wild, but which ones should be planted in the garden, and how should they be arranged? What conditions do they need to thrive? Kathy thought if she was having this much trouble creating a native plant gardens, other people must be as well. When she resigned her position as Executive Director of the Aquatic Outreach Institute (later renamed The Watershed Project), she realized that pesticide use reduction was her area of expertise from her years of non-profit work, and her passion, native plants, which don’t require the pesticides that many non-natives do, were perfect partners. She then started the Bringing Back the Natives Garden Tour, and has been organizing it ever since. To qualify for the tour, gardens must contain 60% or more California native plants, be water conserving, free of synthetic pesticides, and provide habitat for wildlife. No invasive species may be planted, and that includes Mexican feathergrass (Stipa tenussima), which one person removed from their garden in order to qualify for the tour. 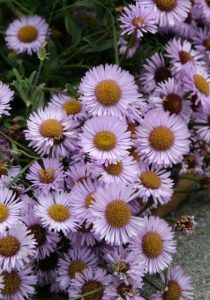 Seaside daisy (Erigeron glaucus). Photo credit Anni Jensen. Kathy has seen how gardening trends have changed since she began the tour. People watched their lawns dry up during the drought. In addition to high water use, homeowners saw the other flaws in turf grass maintenance, including how much pesticides and fertilizers they were applying, the quantity of green waste lawns generate, and the amount of time it takes to maintain turf. Encouraged by the rebates provided by Lawn to Garden replacement programs, many home gardeners were ready for a change. So what should theyplant instead of turf grass? When choosing plants and planning gardens, some of the considerations are what colors, shapes, and scents does the gardener want? Does s/he want to create shade, a space for children or dogs to run around in, and/or a garden that provides food? Another consideration that has recently become is popular is the concept of gardening for wildlife. The Chickadees Guide to Gardening, a charming New York Times Op Ed by Douglas Tellamy presents a compelling argument about why each of us should include native plants in our gardens. This is Kramer’s new rallying call – in fact she has a link to this article in her e-mail signature line. Bringing Nature Home by Douglas Tallamy, and Habitat Network are two great resources for learning why it’s important for our yards to function as habitat, and how you can bring native plants and nature to your garden. Kathy gets a lot of satisfaction out of making the world a better place. Over the years she has seen people go on the tour, become inspired to transform their landscape, and later offer their own garden to show on the Tour. Some native plants are becoming standard inventory at more mainstream nurseries, and it is becoming more common for people to thinking of their gardens as a productive place for wildlife. Register now for the Fourteenth Annual Bringing Back the Natives Garden Tour, which will take place on Sunday, May 6, 2018 from 10:00 to 5:00. This award-winning tour features thirty-seven Alameda and Contra Costa county gardens that are pesticide-free, water conserving, provide habitat for wildlife, and contain 60% or more native plants. This year the theme is “Art and Music in the Gardens.” Artwork will be available for sale in a number of gardens, and gardens containing garden art will be featured. Bluegrass, Baroque, Renaissance music and more will be performed at various gardens; children’s activities will be offered. This self-drive tour showcases a variety of gardens, from large wooded lots in the hills to small parcels in the flats. Native plants will be available for sale, and fifty talks will be offered on the weekend of the event. Pre-registration for the Tour is required. $10 to purchase the garden guide; donations requested. This tour will fill; register early to ensure a place. Volunteers are needed. Registrants will have the opportunity to learn how select and care for California native plants, lower their water bills, design a low-maintenance garden, attract butterflies, birds, and bees, and garden without using pesticides. Mimulus ‘Jellybean Lemon, Orange and Red’ – Jellybean Series Hybrid Monkeyflowers. Photo by Pete Veilleux, East Bay Wilds. 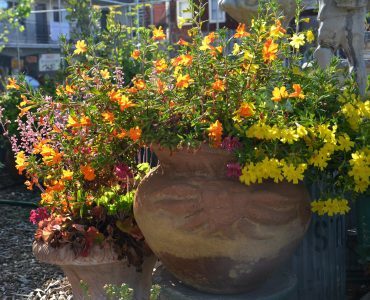 A free Garden Art and Native Plant Extravaganza fundraiser will take place on Saturday, April 28, 2018 from 10:00-4:00 at East Bay Wilds Native Plant Nursery in Oakland. Guests can shop for garden art and native plants at this special fundraiser for the Bringing Back the Natives Garden Tour! Browse through owner Pete Veilleux’s extensive, eclectic collection of garden benches, tables, chairs, statues, planters, antiques, and tchotchkes for sale at great prices. Peruse the more than 400 species of native plants – many of them not available elsewhere – grown at this amazing nursery. East Bay Wilds is not normally open to the public, so don’t miss this opportunity to bring home garden art and native plants that are just right for your garden! A percentage of all purchases will go to support the Tour. A companion feature, the Native Plant Extravaganza, will take place on Sunday, May 5 and 6. These exclusive sales feature a number of native plant nurseries which carry large quantities of hard-to-find California natives, and offers native plant fans both a good selection of native plants and a relaxed shopping experience. Knowledgeable staff will be on hand to help shoppers select the right plants for their gardens. Saturday shoppers will have time to visit more showcase native plant gardens on Sunday, May 6, during the Bringing Back the Natives Garden Tour. In addition, a series of workshops ($35 per person) will be held this spring. Participants can learn garden sustainably (think chickens, rainwater harvesting, and creating pollinator gardens.) Details can be found on the website.